Blossom Philadelphia’s Early Intervention (EI) Program provides supports, services, and consultation to families, caregivers, and children birth to five years old who qualify for early intervention services. Early intervention services may include occupational, physical, and speech therapy, as well as special instruction and social work for children who receive an Individualized Educational Plan (IEP) or Individualized Family Service Plan (IFSP). 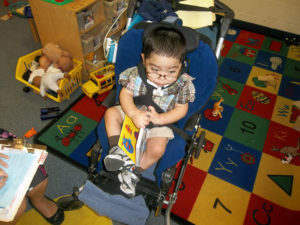 Blossom Philadelphia provides EI services both in the community and as part of our Best Friends Daycare Program. To the greatest extent possible, therapies are provided in the classroom, but will be done in a distraction-free room if needed. Children are encouraged to learn and grow at their own pace and to their full potential. All families are supported through Blossom Philadelphia’s Parent-Teacher Organization, social work services, and professional consultation. To learn more about Early Intervention at Blossom Philadelphia, contact Children’s Services Director Melissa Swain at mswain@blossomphila.org or call 215-248-7605.